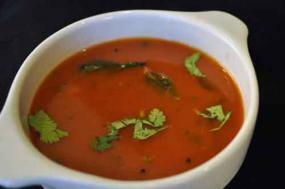 By popular demand from students and bachelors, here is a quick and easy recipe for Instant Tomato Rasam. 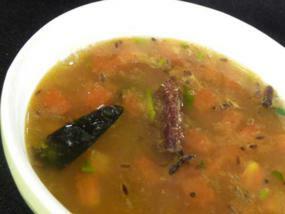 In just a few minutes, you’ll be on your way to enjoying a steaming hot bowl of rasam. 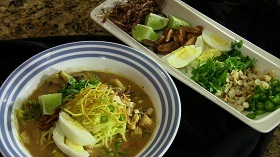 Have it as a soup or with some plain white rice…comforting! 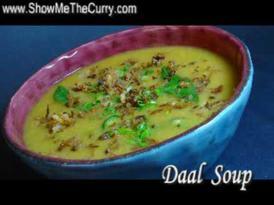 Gujarati Daal (or daar) has a perfect balance of flavors — sweet, sour, spicy! 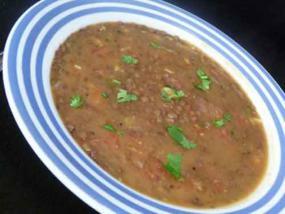 Combined with plain white rice, this daal is the ultimate end to a traditional Gujarati thali. Try this yummy recipe and don’t be afraid to adjust it to your tastes! 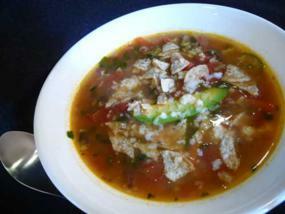 Tortilla Soup is such a wonderful, wholesome soup. It is perfect to warm your heart and your stomach on the days when you need a little help. The different levels of flavor, the inviting colors and a whole-bodied look make it a perfect package. Quinoa is a high protein seed that is perfect for the vegetarian diet. Originally from Peru, this “grain-like” seed is a great alternative to rice and as an added bonus, it is gluten-free. 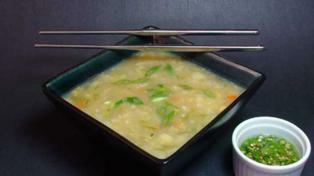 Try Quinoa in this simple and delicious soup recipe. 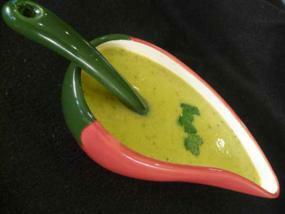 Try a steaming bowl of Jalapeno Soup to warm up the coldest of days. Don’t worry if the weather is not cold. This easy to make soup made with flavorful Jalapeno Peppers is delicious anyway. 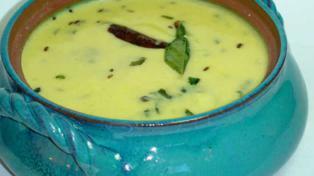 Many regions in India have their own style of cooking Kadhi, a yogurt based curry (or soup). Punjabi Kadhi is easily recognizable because it has Pakodas, fried dumplings made of chickpea flour. 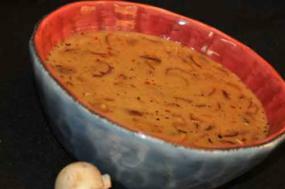 Punjabi Kadhi can be enjoyed with plain white rice or chapati. 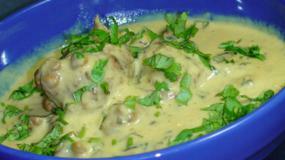 Try this tangy and delicious recipe for Punjabi Kadhi. 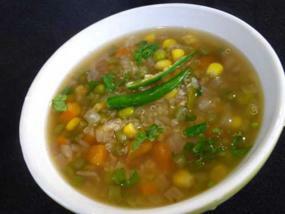 A nice hot bowl of Sweet Corn Soup is creamy goodness without the cream. 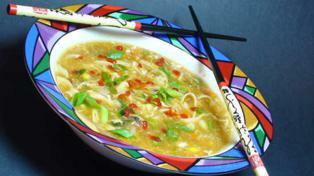 Try this Indian Chinese recipe on a cold winter day…it’ll warm you through and through. 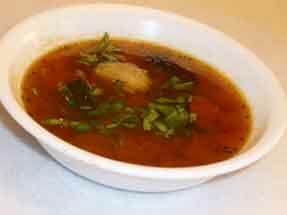 Hot and Sour Soup is a popular Chinese soup loaded with veggies and usually chicken. 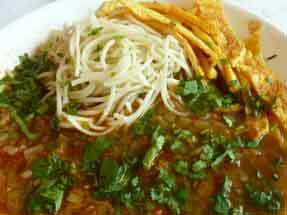 Try this flavorful and hearty Indian Chinese version which is completely vegetarian and can be made vegan also. It’s simply delicious! From the time I was little, Kadhi has always been a comfort food of mine. Like Chicken Soup, Kadhi makes a wonderful hot soup when it’s cold outside or if you are under the weather. Mix it with Khichdi and you have an easy and satisfying meal. 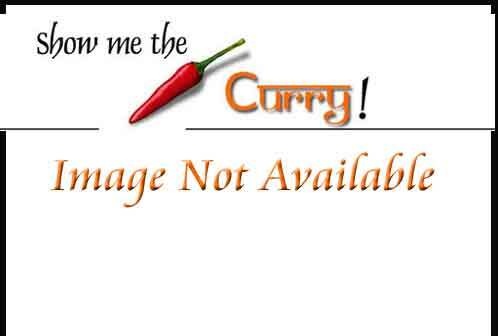 ShowMeTheCurry is not just for the amateur cook or newbie to Indian cooking. Browse through our extensive collection of Indian cooking videos to select from a variety of North Indian Recipes, Punjabi Recipes, South Indian Recipes, Gujarati Recipes, Bengali Recipes, Rajasthani Recipes, Thai Recipes, Indo Chinese Recipes, Kerala Recipes. 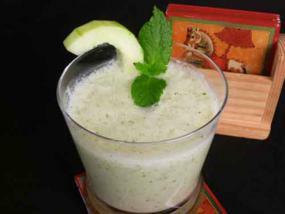 Our recipe videos include Vegetarian Indian Recipes, Vegan Recipes, Healthy Indian Recipes as well as Nonveg Indian Recipes.